Hi, I'm from Japan. Thank you for visiting my application page. Ihope you will take good care of this. ********************************** When you update application,please back up data just to make sure. ********************************** [ Summary ] "SIS PasswordManager" is Password-Management application. I displayed viewlayout and functions based on user operation. Your precious data istightly controlled in an encryption method [AES256]. [ Mainfunctions ] * Add / Edit / Delete items. * Sortable List. *Register notification area. [ Features ] * Very simple and verylightweight. * Application can move to the external storage (SDcard). * Data is encrypted by AES256. * Data Export to storage andImport from storage. * Cloud backup. w/ Google Drive, w/ Dropbox,w/ OneDrive. * Background image which is inspired by WASHI(it'sJapanese traditional paper). * Android 6.0 Marshmallow finger printlogin . Disclaimer Please note that SISYOU.KUM shall not beresponsible for any loss, damages and troubles. Keepass2Android is an open source password manager application forAndroid. It reads and writes .kdbx-files, the database format usedby the popular KeePass 2.x Password Safe for Windows and otherdesktop operating systems. The user interface is based onKeepassdroid, ported from Java to Mono for Android. The backenduses the original KeePass libraries to handle file access to ensurefile format compatibility. 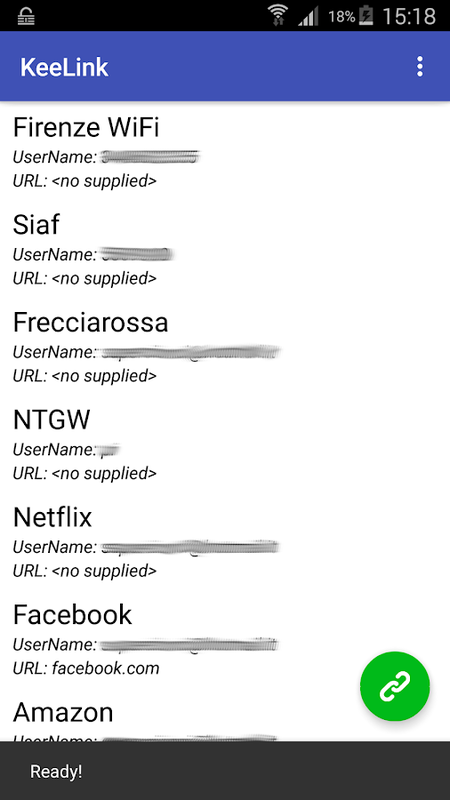 Main features of the App are *read/write support for .kdbx (KeePass 2.x) files * integrates withnearly every Android browser (see below) * QuickUnlock: Unlock yourdatabase once with your full password, re-open it by typing just afew characters (see below) * Access files from the cloud or the web(Dropbox, Google Drive, SkyDrive, FTP, WebDAV). You can use"Keepass2Android Offline" if you don't need this feature. *Integrated Soft-Keyboard: Switch to this keyboard for entering usercredentials. This shields you from clipboard based passwordsniffers (see below) * support for editing entries includingadditional string fields, file attachments, tags etc. * searchdialog with all search options from KeePass 2.x. Requiredprivileges: * Access SD Card * Access Internet (required foraccessing files via FTP/WebDav). Install "Keepass2Android Offline"if you don't want to grant this privilege. * Vibrate Bug reportsand suggestions: https://github.com/PhilippC/keepass2android ==Browser integration == If you need to lookup a password for awebpage, go to Menu/Share... and select Keepass2Android. This will* bring up a screen to load/unlock a database if no database isloaded and unlocked * go to the Search Results screen displayingall entries for the currently visited URL - or - * directly offerthe Copy Username/Password notifications if exactly one entrymatches the currently visited URL == QuickUnlock == You shouldprotect your password database with a strong (i.e. random and LONG)password including upper and lower case as well as numbers andspecial characters. Typing such a password on a mobile phone everytime you unlock your database is time-consuming and error-prone.The KP2A solution is QuickUnlock: * Use a strong password for yourdatabase * Load your database and type the strong password once.Enable QuickUnlock. * The application is locked after the timespecified in the settings * If you want to re-open your database,you can type just a few characters (by default, the last 3characters of your password) to unlock quickly and easily! * If thewrong QuickUnlock key is entered, the database is locked and thefull password is required to re-open. Is this safe? First: itallows you to use a really strong password, this increases safetyin case someone gets your database file. Second: If you loose yourphone and someone tries to open the password database, the attackerhas exactly one chance to make use of QuickUnlock. When using 3characters and assuming 70 characters in the set of possiblecharacters, the attacker has a 0.0003% chance of opening the file.If this sounds still too much for you, choose 4 or more charactersin the settings. QuickUnlock requires an icon in the notificationarea. This is because Android would kill Keepass2Android too oftenwithout this icon. It does not require battery power. 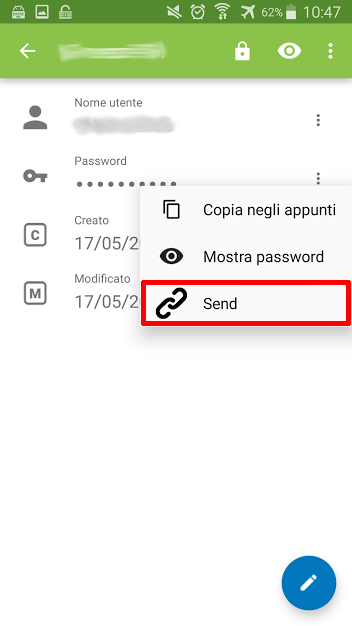 ==Keepass2Android Keyboard == A German research team has demonstratedthat clipboard-based access of credentials as used by most Androidpassword managers is not safe: Every app on your phone can registerfor changes of the clipboard and thus be notified when you copyyour passwords from the password manager to your clipboard. Inorder to protect against this kind of attack, you should use theKeepass2Android keyboard: When you select an entry, a notificationwill appear in the notification bar. This notification lets youswitch to the KP2A keyboard. ON this keyboard, click the KP2Asymbol to "type" your credentials. Click the keyboard key to switchback to your favorite keyboard. KeePassDroid is an implementation of the KeePass Password Safe forAndroid. Read/write support for .kdb and KeePass 1.x. Read/writesupport for .kdbx and KeePass 2.x. This application does not haveaccess to the Android internet permission for your safety. Pleasereport issues at https://github.com/bpellin/keepassdroid/issues soI can follow up. Kaspersky Password Manager offers secure storage for yourpasswords, addresses, bank card details, private notes and imagesof confidential documents, like your passport and driver’s license,and syncs them across all your devices – giving you faster accessto your online accounts, apps and important information. Keyfeatures: -KEEP YOUR PERSONAL DATA UNDER LOCK & KEY Secure yourpasswords, addresses, bank card details, private notes and imagesof important documents in an encrypted vault only you can unlock.-ACCESS YOUR STUFF WITH ONE PASSWORD Unlock your vault with amaster password. Plus access everything in double-quick time usingthe latest fingerprint sensor technology. - SYNC EVERYTHING ACROSSALL YOUR DEVICES Keep your passwords and private stuff synced andeasily accessible across your different mobile devices, PCs, Macsand browsers. -SAVE TIME WITH PASSWORD AUTOFILL Log in to youraccounts quickly and easily through Chrome. -IMPROVE YOUR SECURITYWITH OUR PASSWORD GENERATOR Use our password generator to getstrong passwords. -SECURE YOUR BANK CARD DETAILS Scan and secureyour bank card details with one tap of a button. -STORE ALL YOURIMPORTANT DOCUMENTS Also scan and secure your passport, driver’slicense, medical documents and other sensitive documents, sothey’re out of reach to everyone but you. -SEARCH AND ORGANIZE YOURDOCUMENTS THE WAY YOU WANT Tag documents as “Favorites”. Accessrecently viewed stuff with a single tap. And group items intofolders so it’s easy to find things later. -GET TO YOUR STUFF VIAYOUR MY KASPERSKY ACCOUNT Access and manage passwords and documentsfrom anywhere you can get online. Why you need Kaspersky PasswordManager Remembering all your passwords is hard. In fact, requestinga password reset after a forgot password moment is a chore we allrecognize. With free Password Manager, your personal passwordkeeper, you can save precious time over and over again. With allyour passwords in a password safe and accessible with one password,it’s simple to sign in to your accounts, even those you rarelyvisit – helping you banish forgot password brain freezes for good.But the benefits of free Password Manager don’t end there. Did youknow that besides password storage and protection, the app providesyou with a password generator? With our password generator, you cangenerate strong new passwords, add them to your password safe anduse them to replace existing passwords that put your passwordsecurity at risk. Plus we also guard your most confidentialdocuments in a secure vault – so only you can reach them. So tryKaspersky Password Manager today. It’s not just a password keeper.It’s not just a free password manager. It answers all your passwordsecurity fears plus more. OUR SECURITY We follow Zero-KnowledgeSecurity, which means neither Kaspersky – as the applicationdeveloper – nor anybody else, knows a single thing about your data.Your data belongs only to you and is accessible only by you. Werespect users’ privacy completely. Also, Kaspersky Password Managerdoesn't store your master password on your devices or in cloudstorage. FREE version Does everything the Premium version does, butit only allows you to store a maximum total of 15 entries. Forcorrect operation, please install the latest version of KasperskyPassword Manager free on all your devices. Having the old versionand new version on different devices may cause operating issues. Breaking news! Now you can use your human memory for somethingbetter than various passwords, PIN codes and other secret staff.Password Saver will help you to store and quickly find yourpersonal data. It'll help you to synchronize data across multipledevices and restore it if your smartphone is lost or broken. Sothere is no need for alarm: all data is well protected. Keep calmand use your master password - it's All you need to authorize! *Two words about master password This is the only password you needto log into the app. This is the only password you need toremember. No one in the world can access your data without yourmaster password! Otherwise use your fingerprint to authorize. Inthat case you should choose this option obviously. And now it'stime to tell all the secrets about Password Saver: * Simple anduser-friendly interface We don't like complicated andincomprehensible applications. When it comes to storing passwords -we believe that everything should be simple and reliable. * Datasynchronization Password Saver will synchronize your data andrestore it at launch on a new device. Our app does it with a helpof the Dropbox service. We highly recommend using thesynchronization feature. You will definitely sleep well with it. *Data fully protected Data is stored only in encrypted form. The AESalgorithm for encryption is used. * Password generator Useful thingwhen you think of a new and complex password. 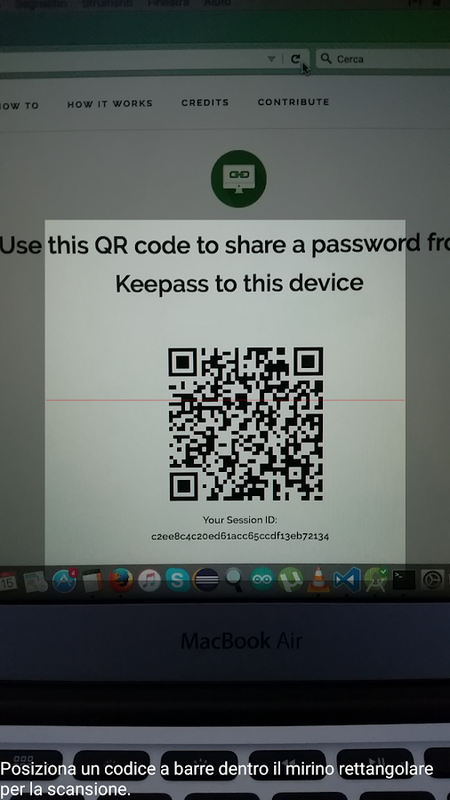 * Fingerprint login(Android 6.0 and above) You do not need to enter the password eachtime, you quickly open Password Saver with a fingerprint. * Dataresque and transfer You can create backups. A backup is a file thatcontains a backup copy of all your data. Of course, the contents ofthis file will be encrypted. And if you transfer the backup toanother device, you can restore data from it only by knowing themaster password. * Free We do not require you to make internalpurchases in order to use any features of the program. All of themare available immediately and free of charge. * Worth a thousandwords Try Password Saver and you'll recognize: it's one of the mostpowerful and useful apps for smartphone and tablet. Still doubt?Just download and make sure that this app is right for you. By theway, its weight is not great: about 7 megabytes.